There are couple of methods to determine where to drill and maximise your chance of finding good water. There are scientific methods such as using geology, satellite photos or proton magnetic resonance (PMR) investigations, and there is dowsing. Depending on your established belief systems, you will relate to the following or not. If you do, you will find it fascinating. Personally and from diverse first hand experiences over the years I will say that I believe it has a lot of credence. Dowsing has been used for thousands of years. As with any other method of doing anything, there are exceptional dowsers and not so effective ones. Personally I rely on word of mouth and evidence of success when choosing any service or provider. 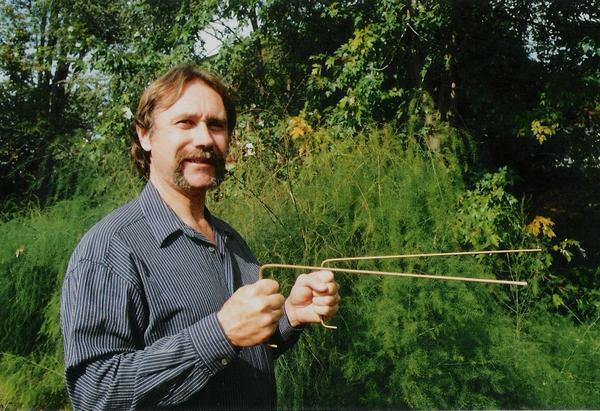 Steven G. Herbert from The American Society of Dowsers has graciously supplied us with a fascinating article and explanation on the history of dowsing, what it can do and how it works. ‘Indago Felix’ – Latin for “The Fruitful Search”. This is the motto of The American Society of Dowsers, emphasizing the immense practicality of this ancient art. And what could be more practical than the location of underground water, the lifeblood of the earth? Indeed, the word “dowsing” likely evokes a stereotypic image of an old farmer in coveralls trudging across his fields with a forked stick. Beyond the stereotypes, however, in reality, people of all professions and all walks of life practice dowsing in an infinite number of applications. Dowsing can be defined as “The search for information by means of a hand-held instrument and faculties beyond the five physical senses”. There are two basic types of dowsing; tangible target and informational. However, whether one is searching for a physical object or substance, or for pure information, ultimately all dowsing is a search for information. It is accomplished by tapping into a higher level of mind and spirit. The search is facilitated by four main types of dowsing instruments employed by modern dowsers; the Y-rod, L-rods, pendulum and bobber. By itself, the tool detects nothing, but merely functions as a “read-out device”. It is the body and the auric field which is the detector and receptor. Ultimately, it is the goal of all dowsers to someday be able to dispense with the tools all together and receive information directly to consciousness. The ability to find water beneath the ground by dowsing is innate, if often latent, in all humans. It is an inheritance from our animal ancestry, a sense that evolved from obvious survival value. Animals are natural “deviceless” dowsers, their ability also being closely related to the capacity to sense the electromagnetic fields of the earth, which they use for orientation or migration. Anyone can dowse, though for some it is a skill which will come quickly and naturally, while for others it must be developed slowly. Oddly, whether it comes immediately or with time does not seem to depend on whether you are a believer or a skeptic. It matters more what you believe subconsciously. Humans have dowsed all through the ages. Paintings on cave walls in the north of Africa dating back 8,000 years can be interpreted as a dowser holding a forked stick. Depictions on pottery and tomb walls show dowsing instruments such as staffs being used by ancient Egyptians and Etruscans. Coins, figurines, and other artifacts depict dowsing in use throughout the Mediterranean and Mesopotamian worlds. A 4,000 year old bas relief with inscription at the dawn of historical times speaks of dowsing by the Emperor of China. Many passages in the Bible elude to dowsing. This art was brought to America by Europeans, who used it extensively for the location of both water and minerals.Having been well established in the collective unconscious for many millenniums before, one may likely experience today an immediate response from the dowsing instrument. However, it is important to emphasize that dowsing is ten percent getting a reaction and ninety percent developing accuracy. The three keys to accuracy are; attunement to the Source, resonance with a clearly defined target, and concentration on the right question. With practice, patience and experience, one can expect over time to move through seven levels of dowsing proficiency; 1) location of physical objects on site, 2) detection of tangible targets at a distance and up to the horizon, 3) remote location of physical targets, 4) informational dowsing, 5) cooperation with nature, 6) co-creation with nature, and 7) conscious union with creative forces.Accuracy in dowsing also depends on following correct procedure, observing proper ethics, and avoiding interference factors. Correct procedure begins with clearly establishing codes, so that the movements of the instrument can be correctly interpreted. It is of utmost importance to start any dowsing session by first identifying the source of your information, and insuring that it is from only the Highest and Purest level. Otherwise, your dowsing will be no better – or no safer – than using a Ouija board. One must establish that he or she has the permission to dowse a particular subject or object of search, that one has the ability to do so with accuracy, and that all is in proper timing. It is crucial to proceed with the proper attitude of faith, trust, respect, sincere motivation, and true need. Ethics should be maintained so that dowsing is not abused for greed or selfishness, the compulsion for ego control and manipulation, or to intrude on another’s privacy or free will. 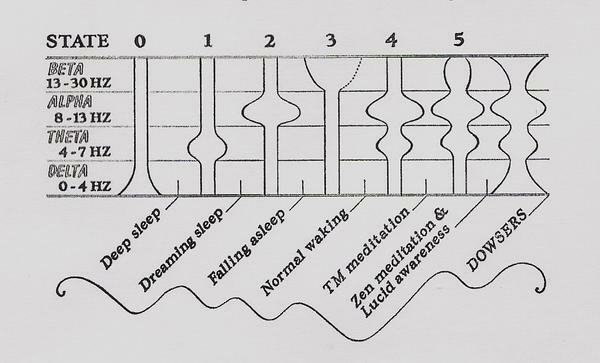 Interference factors to avoid can range from the purely physical, such as drinking too much coffee, to serious spiritual blockages, such as psychic invasion. Both strong mental bias or emotional attachment can also distort the answer. 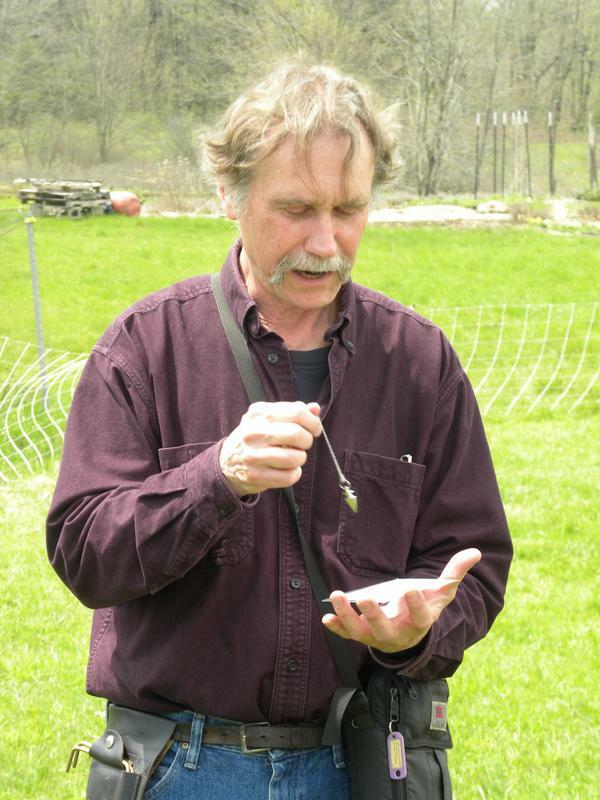 How does dowsing work? There are as many theories as there are dowsers, but that which carries the most consensus is one which involves several levels of mind. A question is posed to the subconscious mind, which relays the question to the superconscious mind. The subconscious then conveys the answer to the conscious mind by means of the movements of the dowsing instrument. Studies of the brain wave frequencies of dowsers* seem to support this hypothesis, in showing that dowsers are able to function on several frequencies at once (beta, alpha, theta and delta, corresponding to the waking state, reverie, dream sleep and deep sleep, respectively). Not even transcendental meditation could match this. Because of the nature of the subconscious, one must phrase questions in precisely literal and specific terms. This is the real art of dowsing, to ask the right question. However, correct interpretation of the dowsing response is also very important. The search for underground water is the best example of the great practicality of the dowsing art. Typically, dowsers search for “living water”, that is, water which comes from the depths of the earth, rising to form domes, and extending out laterally in pressure-flowing veins. Such water is much purer, a more steady and reliable supply, and sometimes is found at shallower depths than the static groundwater found in aquifers. A dowser may also find below the surface, oil, gas, minerals, archaeological sites, buried treasure, or underground utilities. One may more often use dowsing in daily life to locate objects on the surface of the ground. You may want to find your car in the parking lot, for example, or locate your lost car keys, a missing checkbook, or a misplaced remote. Dowsers are often asked to find missing persons or pets, or help the police solve crimes. One can also dowse less tangible targets, such as in determining the health of a place by dowsing the geopathic or geovitalizing energies. Informational dowsing can be employed in making dietary decisions, such as choosing vitamins and supplements, for example. You may use it to determine the best course of action or the solution to a problem, whether it be in job hunting, looking for a house or apartment, or seeking a healthy relationship. Another practical application is in gardening; dowsing soil conditions, amendment needs, time to plant, expected weather conditions, etc. The potential uses are limitless. All dowsers vary as to what application they specialize in and excel at. They also differ in which of a great variety of dowsing instruments work best for them. What they all have in common, however, is the empowerment dowsing gives them. Its practice facilitates the connection to Higher levels of Mind and Spirit, with simple, inexpensive and readily available tools. Trust in the direction and guidance of the Source of All leads to a life lived more in alignment with one’s own soul purpose, as well as with the Universal Plan. In other words, dowsing opens one to a Greater Reality and the joy of feeling a valued part of the Whole, as well as the sense of fulfillment that comes with fruitful service. Steven Herbert is a geologist, anthropologist, development worker, writer and international dowser. For more information on The American Society of Dowsers and the location of a local chapter near you, visit the website at www.dowsers.org. If there was no longer any oxygen in our air, where would we be? Obviously very dead, because we are not designed to live without oxygen in the air we breathe. Well guess what! Oxygen in water is important as well. It is beneficial for humans and stock – directly and indirectly. It is especially important for health and growth of plants. Why do plants grow far better after a rain, than after periods of irrigation? Because sadly most of our water supplies are depleted of oxygen, while rain is rich in it. Apart from various dissolved compounds and chemicals, dissolved oxygen makes a significant difference to water. Studies have shown, that water poor in DO (dissolved Oxygen) will take away oxygen from plants through the root system as well as deplete soil oxygen, both of which are needed for a healthy plant and a heathy soil bacterial flora. Water does this in order to return to a balanced oxygen state. Past research has shown that reducing the concentration of DO in the root zone of plants will compromise the plants’ ability to absorb nitrate and water. Research has also demonstrated that roots are injured by O2 deficiency and that plant metabolism changes during acclimation to low concentrations of O2. Oxygen deprivation in plants is called internal anoxia and one of its results is sucrose degradation whereby the plant goes into an energy-conserving pathway to compensate for the lack of oxygen. So basically the lack of soil DO is a problem that keeps compounding the longer it lasts. There are number of ways to fix this, but you may or may not know - that if using bore/well water – the Brumby Pump aerates your water significantly via its vortex action, adding oxygen to the water. This action helps bring the water back to life. Please feel free to CONTACT US for more information or check out www.brumbypumps.com . It is quite common for bores/wells to slow down due to sand and silt depositing in the bottom, which is drawn in from the water bearing structures. This can block off the water bearing zones and also damage regular pumps due to blocking up, abrasion and burning out. off. If bottom of strainer is slightly damaged, that doesn't matter. piping at the top, as the pump will go down deeper than it was. by the piping, while the compressor is still running. again and replace the cap. You may think that running a compressor to operate your Brumby pump is going to cost you a fixed amount of money in energy - no matter what. Well, there are things you can do to not only reduce your running costs, but also potentially increase the life of your compressor. The only point you can't control with the Brumby Pump - (except to raise or lower the pump in the water, which will affect delivery rate) is the pressure (point 3). Usually keep the regulaor turned up full. We were talking to a farmer recently, who had bores/wells equipped with windmill pumps around his large farm. He was looking for a solution that allowed him to keep running his existing windmills and still deliver water when the wind wasn’t blowing. He had sheep that required water and on long wind-still periods his tanks got low or ran dry. This meant he needed a back-up for his windmill pump. We looked at options and the design of the windmill pumps and worked out that he could actually fit a Brumby Pump to the tail of the windmill pump (underneath the windmill pump/jack pump). In doing that, the windmill pump could draw water through the Brumby Pump and carry on as normal. However, when the wind wasn’t blowing, he could simply attach a portable compressor to the Brumby Pump and controller and push water through the windmill pump to keep his supply going and his sheep watered. At the same time, he would have a back-up for the windmill pump when the buckets/seals wore out and it stopped pumping. He could run the Brumby and carry on doing other things until he had time to remove and repair his windmill pump, which can be very in-convenient – especially at seed or harvest time. It is a simple set-up. As his bores are a long distance from power, he could just bring a diesel driven compressor to the site when the need was there. The same can be done by operating just a Brumby Pump off a windmill compressor. In this case – when the wind doesn’t blow – a diesel or petrol/gas compressor can be connected into the air supply line and the water supply will go on. For more info on the Brumby Pumps, go to www.brumbypumps.com. To find the depth of a bore/well, lower a weight on a LIGHT string into the bore/well until you feel it hit the bottom. Then mark the string at the top of the well, pull it out and measure the length of the string that was down the well/bore. NOTE. You need to use a light string in deep bores/wells (light fishing line may be good). If the string is too heavy and the weight too light, the weight of the actual string can make it difficult to feel when you hit the bottom . To find the static water level, lower a small bottle (with a little sand or gravel in it to give it weight if it is a plastic bottle) into the bore/well on the end of a LIGHT string until you feel it hit the water surface. Then mark the string at the top of the bore/well, pull it out and measure the length of the string that was down the well/bore. The purpose of this blog is for people using the Brumby pump with helpful hints and tips about the installation and operation of the pumps. This blog is intended to be a helpful tool and resource for people to use. The Brumby Pump is a unique air operated submersible pump, that overcomes many of the problems that other pumps are prone to, such as burning out, seizing, corroding, blocking up and more. We look forward to your helpful tips.